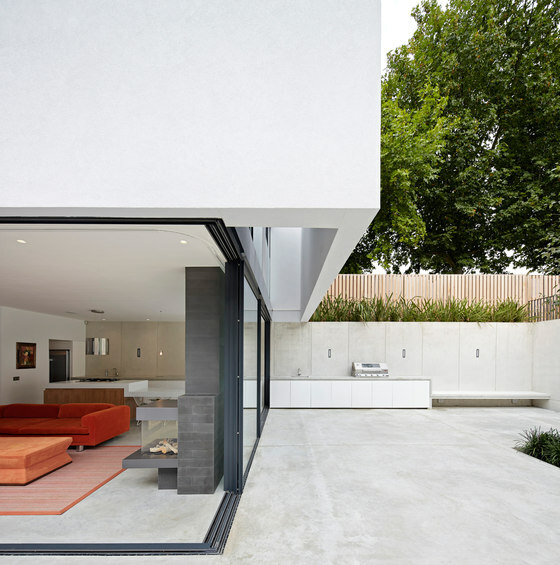 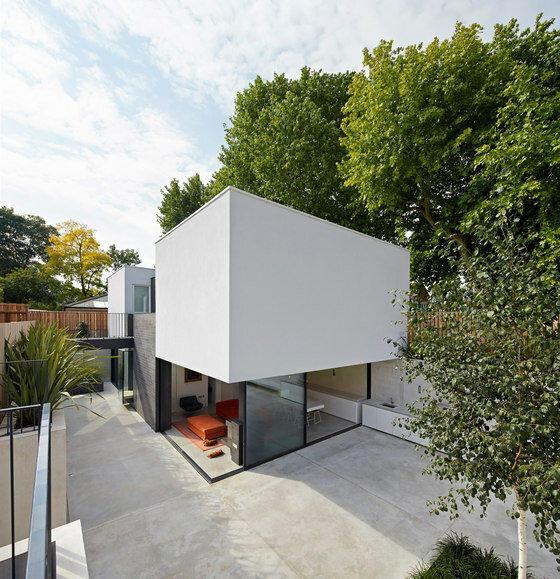 The Garden House is a new 179 sq m house at the far end of the rear garden of a Victorian house in South West London. 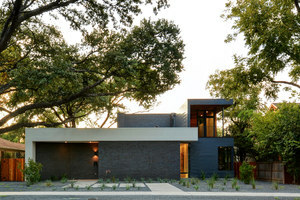 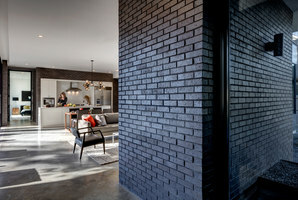 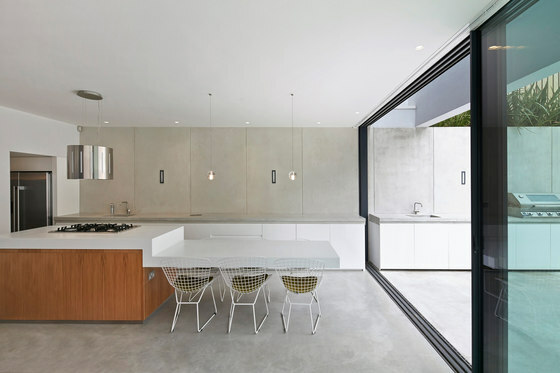 A modern family conundrum was the unexpected catalyst for the creation of the new annex - the immediate need of a newly married couple bringing two families together and requiring additional space to accommodate seven children. 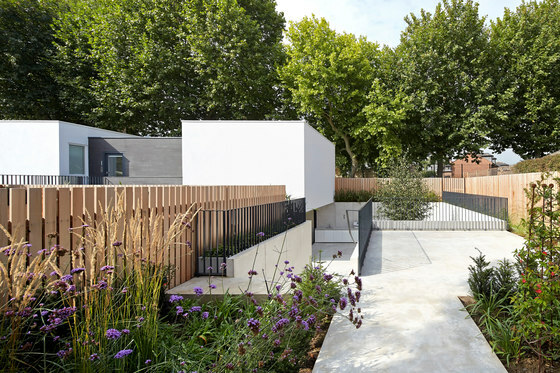 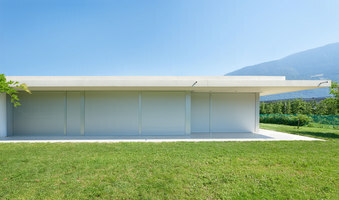 The practice was originally briefed to create a garden annex to replace a potting shed and greenhouse that the older children could move in to. 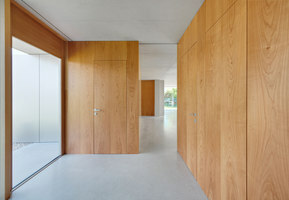 The arrival of an eighth child midway through the design stages prompted a rethink of this arrangement and resulted in a change of plan: the calm and convenience of the new annex was deemed to be the ideal retreat for parents with a new baby and younger children whilst the main house would become the older children’s domain. 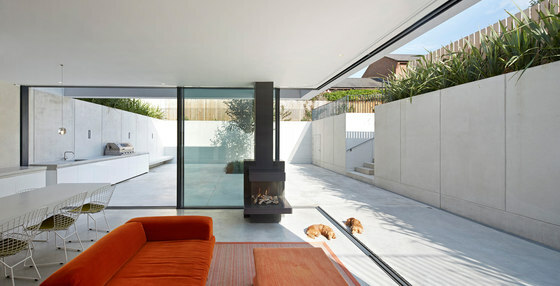 The design of The Garden House has been driven by three challenges including the clients’ ambitious requirement for increased space; the need to incorporate compulsory flood-proofing measures due to the site’s close proximity to the River Thames; as well as complying with planning restrictions to prevent the overlooking of neighbouring properties. 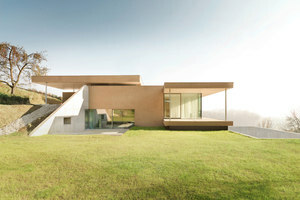 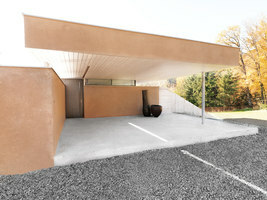 The new house comprises five bedrooms, three bathrooms, a study and a kitchen/living room. 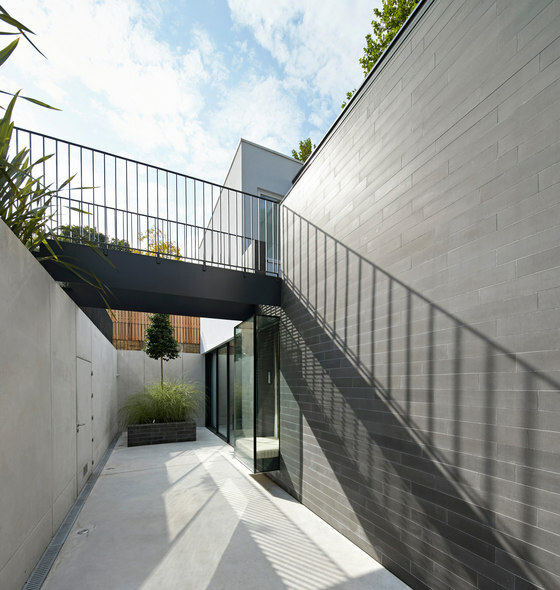 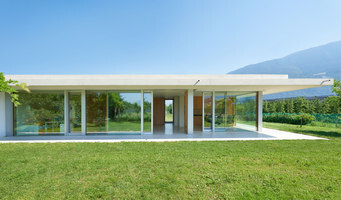 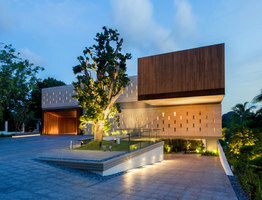 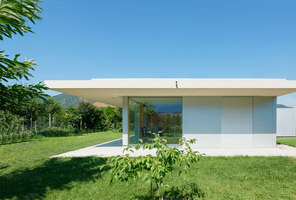 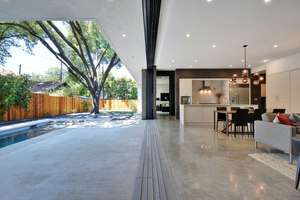 The garden was excavated to create a high-sided watertight concrete courtyard, which increased the floor plate of the property without affecting the single storey appearance at garden level. 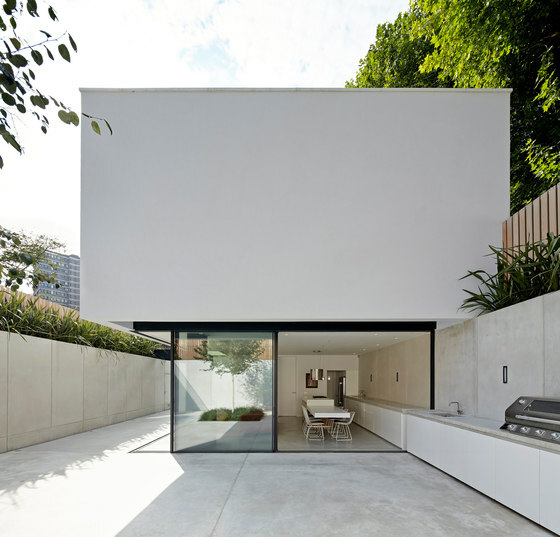 The living areas are at courtyard level and benefit from full height glazing; the bedrooms are arranged at first floor level in clean white volumes that gently ‘float’ above the glazing. 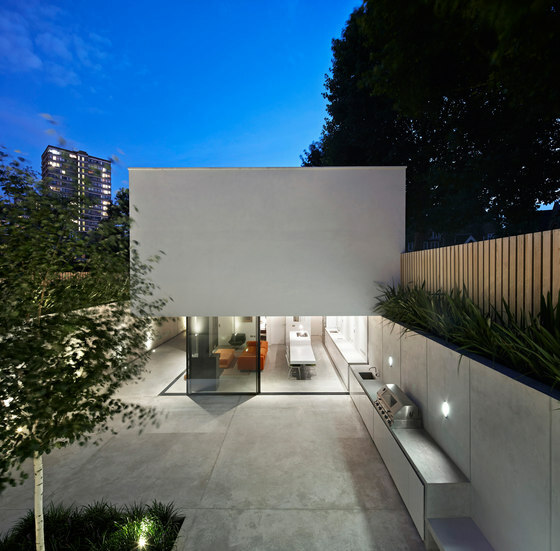 A bridge at garden level bisects the white box and marks the entrance to the property. 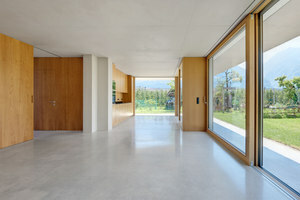 Windows are discreetly located on the side and rear elevations to comply with planning restrictions and frame views out. 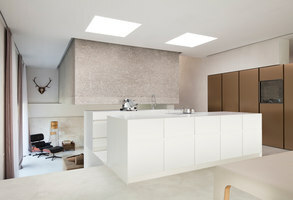 A combination of internal lightwells and rooflights ensure that the bedrooms are flooded with natural daylight. 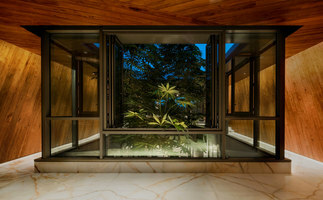 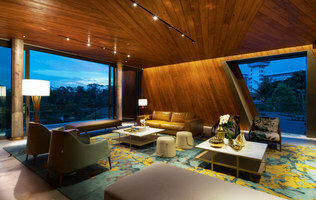 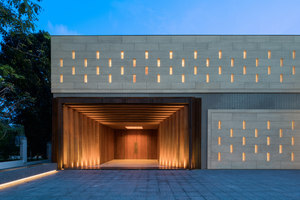 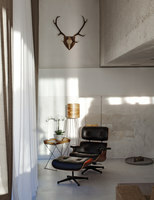 Top lit hallways and bathrooms connect the volumes. 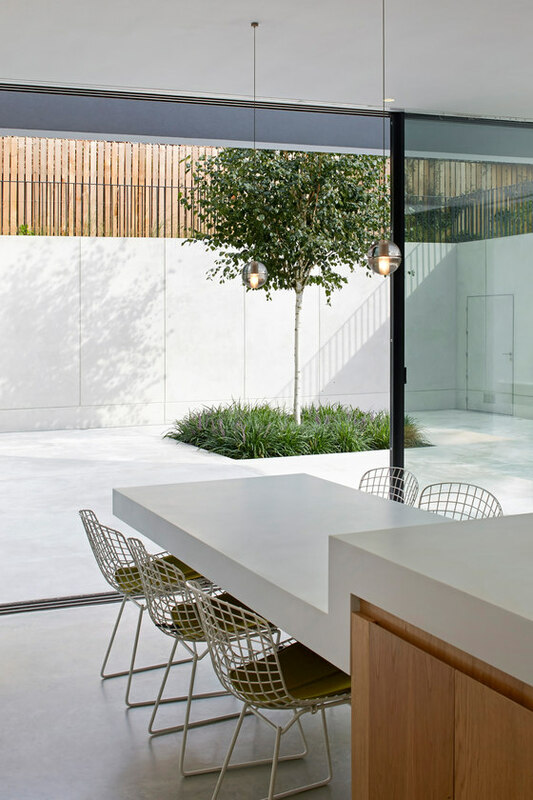 A playful improbability of form manifests itself throughout the scheme: from a floating dining table cantilevered from the kitchen worktop to the apparent mass of the upper volumes that appear to float above a glass wall. 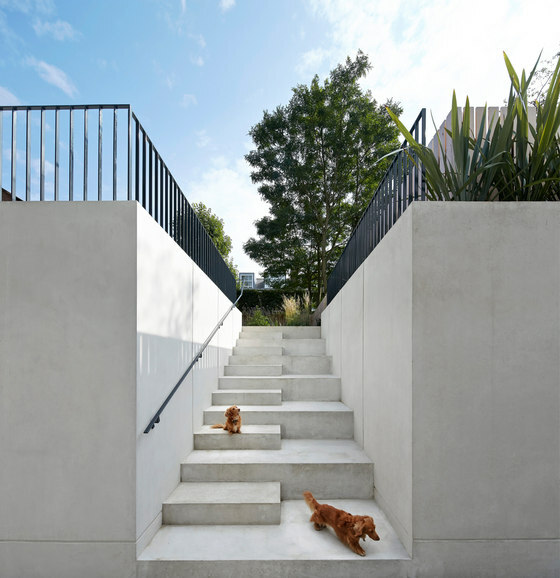 This playfulness was a key aspiration for the project to add to the surprise and delight of discovering a house at the bottom of a garden.